Picture Books: What does it mean to be character driven? At Saturday’s conference, Brianne Johnson, senior agent at Writer’s House, gave an absolutely amazing session on character driven picture books. Yeah, yeah. We all know what it mean — the character’s personality drives the plot. On one level, I’m sure you get it. I know that I did before this session. The character’s personality somehow puts the plot into action. This same personality effects every decision that the character makes and every action that she takes. And it all comes down to some character trait. Fancy Nancy snazzes things up. David is a whirlwind force of destruction and things fly apart in his wake. The pigeon? He wheedles and argues like a three-year-old. We know this and we use this knowledge when we write. Every now and again we’re pretty sure that we’ve been successful. Want to test it out? Take your amazing character out of the story and substitute Adorable Precocious Child #1. Adorable Precocious Child is any generic cut, smart, nosey kid. Put this character in place of your character. Now look at how your story changes. What do you mean it doesn’t change? If your story is character driven, it has to change. After all, the original story was drven by a character who is no longer in it. If it is character driven, it has to change when you swap out your character for another. If it doesn’t, either your story wasn’t character driven or your character was too typical. It’s time to go back to the drawing board and either jazz up your character or rework your plot. Me? I’ve got some work to do, but I’d rather figure that out myself than have Bri tell me when I send her my manuscript. At Saturday’s conference, Roaring Brook’s Connie Hsu (pronounced Shoe) discussed quiet picture books — what they aren’t, what they are, and what it means. This wasn’t a session topic but we have just seen a preview of The Night Gardener by Terry and Eric Fan. It will be published this spring by Simon and Schuster. This book grabs you by the heart but it is not a rolicking good time. When a conference participant called it quiet, Connie objected. She explained that neither The Night Gardener or Polar Express are quiet although they certainly are not rowdy. Instead, the words that she used to describe both books included evocative, classic and cinematic. She explained that to fully understand what a “quiet” manuscript is you have to put aside your traditional definition of quiet. After all, both book are quiet in the way that outsiders use the word. When an editor calls a book quiet, Hsu explained, what she means is that she won’t be able to get the sales department “loud.” It is a book for which they would have no enthusiasm. It won’t excite them. That might mean that they’ve seen it before. It might mean that it simply fails to engage them. Just a little something to think about. What books seem quiet, in the traditional usage of the word, yet people connect with the book and recommend it to others? Owl Moon. Goodnight, Moon. Dream Snow. All three of these books are “quiet” in the way that we traditionally use the word but they are clearly loud in publishing terms. People love them to this day. What is it that these books have? Depth and emotion. The next time an editor tells you that your manuscript is too quiet, take another look. Don’t look for rowdiness but do see if you can spot depth and emotion. Saturday, I had a great chance to recharge my battery. I went to the Missouri Society of Children’s Book Writers and Illustrators (SCBWI) fall conference. Yes, it is work related. No, I don’t get to honor my introvert self by avoiding people, but I get to do something even better than that — I get to spend all day with people who love children’s literature as much as I do. A conference is often a larger event. Some are single day. Some are multiday. There is usually more than one speaker. The SCBWI winter conference in New York focuses on marketing. The SCBWI LA conference each summer focuses on craft. Some conference are simply for information gathering. You go, you sit, you take notes. Other conferences feature workshops . . .
A workshop is very different from a conference in that this isn’t simply a session where you sit and take notes. This is a session where you do. A workshop on dialogue when involve writing new dialogue or improving on existing dialogue. Some sessions might involve writing exercises. Others might involve improving a manuscript you’ve already written. A retreat is generally an overnight event. Some writing retreats feature speakers who lead sessions on craft. Some simply offer time to write or to interact with your fellow writers. The venue can be elegant — I’ve stayed in some very stately B&Bs — or rustic. Read the details of any event you are considering carefully. A single day event can be easiest to work into your schedule. When it comes to multiday events, I have to admit that I prefer retreats to conferences, but only you can know what is the right event for you and when is the best time for you to recharge. Check back throughout the week for more of what I learned at the conference. For more on recharging, see yesterday’s post at the Muffin. Guess what just came? 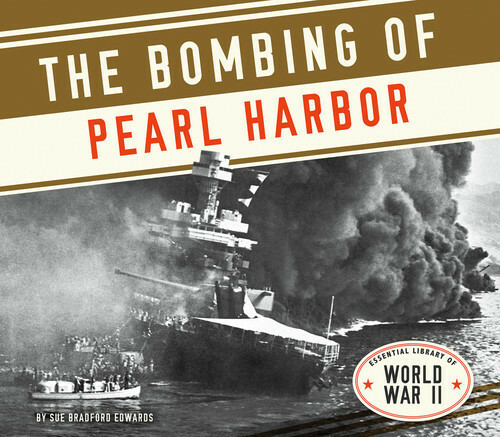 My other new book — The Bombing of Pearl Harbor from Abdo. That’s right. Two books in a week. Believe me. This is not my typical week. This is too much like Christmas. My typical week more closely resembles controlled chaos. Speaking of chaos, I’m currently working on 3 different deadlines. I have one more science experiment to figure out and then rewrite and four activities to photograph for one job. I’m almost done with the first draft of chapter 1 on another. I just have two more sidebars to go but I also have to outline the remaining 8 chapters. And I have 45 contest entries to judge. As busy as I am, I’d much rather have this type of chaos than the chaos depicted on the cover of the book! That said, I’m still happy to have my latest book baby here with me. 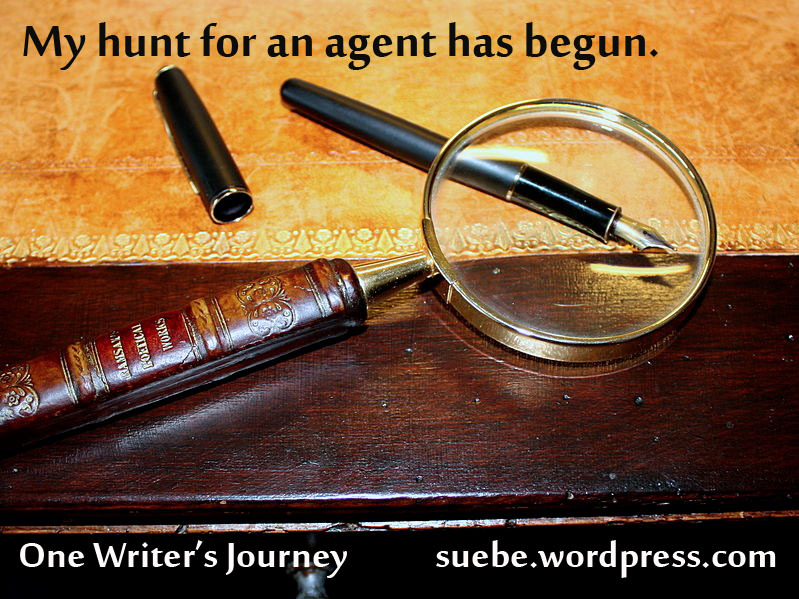 Now that I’ve found a pair of agents that interest me, I need to get my work ready to submit. The manuscript itself is ready to go but that doesn’t mean I’m ready although I’m working to get to that point. First, I checked out the submissions guidelines for both the Bent Agency and the Prospect Agency. Each agent at the Bent Agency has a separate e-mail address. The submissions guidelines tell you to look at the agent’s bios and pick out the agent who is the best match for your work. I’ve already done that. Next comes writing my letter. They have specific things that they want to see in the letter. They want to know about the manuscript, who am I and why am I qualified to write this particular book. I’d love to say that my letter is ready to go. Nope. It’s clunky and awkward but at least I managed to draft version #1. I want to go through my notes on Susan Hawk again and make sure there isn’t some more I need to say in the letter. Then I’ll go about making it sound good and making it tighter. The Prospect Agency requires submissions through a form on their site. You don’t submit to a specific agent and are told that if there is an agent who is interested in your work, they will contact you. Again, I have roughed out my letter, but, I have to admit, I’ve done so with a specific agent in mind. I’m letting these letters sit for a few days and then I’ll work on them again with fresh eyes. Copyright: What do you know about Fair Use? I just finished up the class on Copyright for Educators and Librarians (see video introduction above). I wasn’t sure how they could stretch this topic into five weeks but now that I’ve taken the class I understand. Copyright is an insanely complicated topic. A lot of what we think we know is just plain wrong. For example, what do you know about fair use? I’d been told that if you use less than 100 words from any text, it falls under fair use. Guess what? That’s not true. Fair use doesn’t state a word count, a page count or a number of seconds of film. Fair use is designed to protect freedom of speech. Because of fair use, you are allowed to report on something, review it and even use it in teaching or research. Sometimes something you want to use for a commercial purpose falls under fair use. In short, your use has to be “transformative.” You have to build on and somehow go beyond the original. Just how much you can use, or if you can use something at all, depends a lot on how you plan to use it and the nature of the original work. If something is highly creative, like poetry or a painting, you won’t be able to use as much if any of it. Nonfiction is easier to use because you can copyright expressions of fact but not the facts themselves. If your use means that the original creator will be less able to profit from her own work, your use is less likely to be fair use. Interestingly enough, you can often get away with using a small duplicate of a work of art because a small image is no substitute for a full-sized painting, poster or photograph. All of this aside, the publication for which you are writing likely has their own set of guidelines. If they say “100 words” is the limit, then that’s the rule you have to use. And, in the meantime, signing up for this class would be a great way to educate yourself. I hadn’t, but the package had that distinct feel. Books! 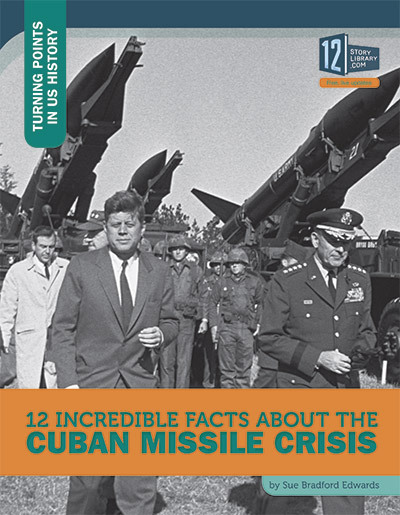 I ripped it open and out slid 2 copies of 12 Incredible Facts about the Cuban Missile Crisis. Somehow I had missed the birth of my most recent book baby which came out in August. This one if from 12 Story Library and is one of 8 books in their “Turning Points in US History” series. In addition to the book itself, you can visit the blog and read up on recent related events including a project to restore Hemmingway’s home. Additional links include a video, web resources of various kinds, and (my favorite) security Tweets. At the moments the Tweets are about Kenya and China and not Cuba. Now if you’ll escuse me, I have a book baby to (re)read. Mine the PW rights report for information on agents selling your type of work. If you don’t read the weekly “Rights Report” by Publisher’s Weekly then you should. This weekly feature tells which agents have sold manuscripts to which editors. Don’t shake your head at me. This is a big deal. This information isn’t as dated as most market listings. It isn’t a laundry list of what someone might consider. This is what they actually bought. The report for 8/31 includes information about over a dozen editors including: Calista Brill (First Second), Karen Lotz (Candlewick), and Megan Tingley (Little, Brown). While these editors are from closed houses, this is still important information. Want to know which agents successully make sales to these editors? Go to the end of the paragraph and you’ll see who prepresented each piece. That’s the information that is most important for me right now. From this single rights report I’ve found the names of five agents to explore. Three represent narrative nonfiction (whoot! ): Bernadette Baker (Victoria Sanders), Stephen Barr (Writers House), and Eddie Schneider (JABberwocky). Two more represent picture book authors who don’t also illustrate: Tracy Adams (Adams Literary) and Scott Treimel (Scott Treimel NY). Yes these are the big names but why not shoot for the stars if they represent your kind of writing? If they are accepting work and your work is a good fit, it makes sense to give them a try. If you’ve heard it once, you’ve heard it a thousand times. “You have to promote your work.” One way to do this is to offer a variety of materials to your readers. Because I write so much nonfiction, I’ve been playing with the idea of creating infographics that teach about my various topics. I could make up a Maya time line or a piece on Mayan science. For Pearl Harbor, I could do a line up of the major personalities involved. I could if I knew how. 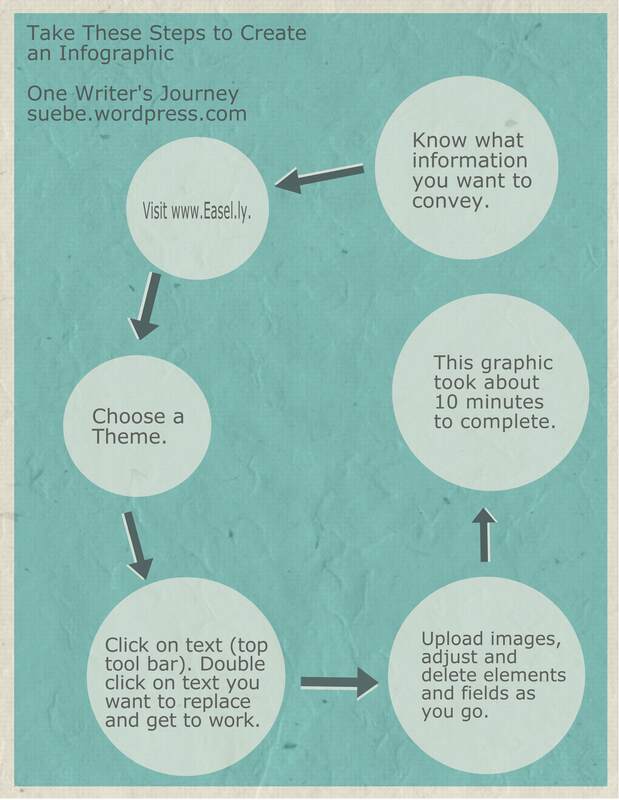 Then I saw Cathy Hall’s Muffin post, An Easy Infographic Tool, about using easel.ly to create infographics. I have to hand it to Cathy, it really is easy. I know it isn’t brilliant by a long shot but I created the piece at right in about 10 minutes. If I had gone into it with an actual plan (hence step #1), I could have actually done something impressive. Whether you are preparing something for your site, your blog or as a graphic in workbook or other document, this is definitely a tool that you need to know how to use.